Michelle grew up on a farm in San Joaquin County. She received her B.S. in Crop Science and Management from U.C. Davis and her M.S. and Ph.D. in Horticulture from Cornell University. 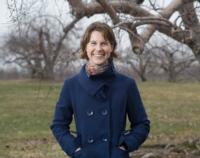 At Cornell, her research focused on soil management in apple orchards. As the Delta farm advisor, she serves San Joaquin, Sacramento, Yolo, Solano, and Contra Costa counties addressing crop production and water and soil resource management.